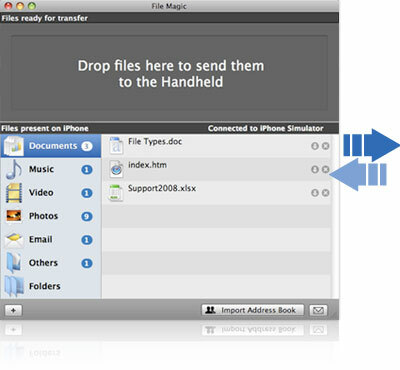 File Magic is a file transfer utility that allows you to put any type of file on your iPhone or iPod touch so you can take them with you - like a briefcase. Supported file types can be viewed on the handheld, but other files can be added as well as a means of transporting them to another computer; between work and home for example. Drag and drop your files... and be on your way. FREE desktop companion software for Windows & Mac OS! Launch File Magic on the desktop and the handheld. The handheld application will ask you to allow the connection. Drag and drop any file into the File Magic desktop and it will be transferred over Wi-Fi to the device. You will see the progress of the transfer on both the desktop and handheld applications. Tap the folder, then the file you wish to view on the handheld. - Create emails on the desktop and sync to the iPhone application for easy email typing when your desktop is offline.